Congress general secretary Priyanka Gandhi Vadra made her debut in active politics on Monday with the massive roadshow in Lucknow, Uttar Pradesh. Priyanka was accompanied by Congress president Rahul Gandhi, and general secretary Jyotiraditya Scindia. 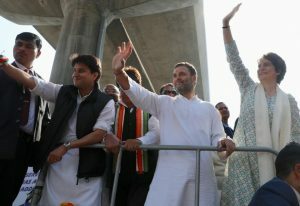 Priyanka along with Rahul and scindia greeted thousands of well-wishers gathered along the path of their roadshow in Lucknow. “Lucknow is filled to the brim with Congress supporters that have gathered to see Congress President @RahulGandhi & GS Incharges UP East & West @priyankagandhi & @JM_Scindia during their roadshow,” Congress tweeted. After the roadshow, Rahul Gandhi addressed the crowd at Lucknow’s PCC office. 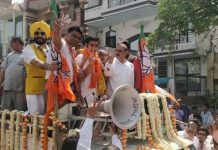 He urged the people of UP to topple the ruling Bharatiya Janata Party (BJP) government in the state. 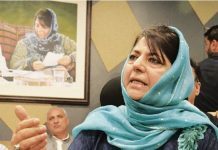 He further said, he has appointed Priyanka and Scindia as the General Secretaries of UP and they both have been instructed that they should fight against the injustice meted out against UP. “We will not rest until we form a government that belongs to the youth, farmers and the marginalised. This is an ideological battle. On one hand there is the Congress ideology of love, harmony and brotherhood. On the other, there is BJP-RSS ideology of dividing and weakening the nation,” Rahul said. “The hollow promises of Modi have come to light. Congress workers must fight this battle with issues that concern the youth, farmers. There are no dearth of issues. 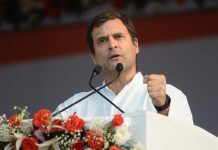 Congress party will fight to transform UP and the nation,” Rahul said.